Keeping up with our loving but furry friends can be a challenge at times, especially if they happen to be large friends. 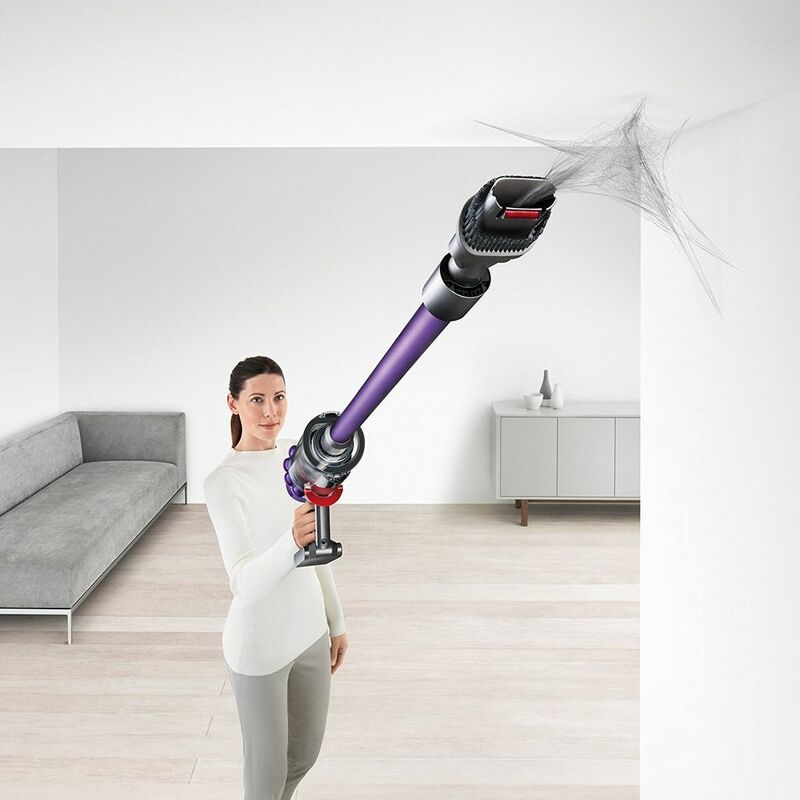 This new Dyson Cordless Vacuum—the V10 Animal—has 20% more suction power than the V8, plus has a whole-machine, completely sealed HEPA class filtration system. 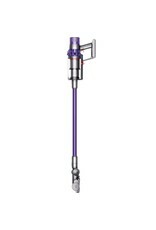 Lightweight, maneuverable, with additional cleaning tools designed for animal lovers, cleaning your home has never been easier. 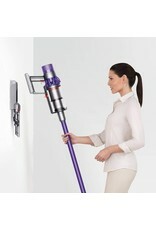 The Dyson V10 Animal comes with a powerful torque drive cleaning head that removes 25% more dust from carpeting. 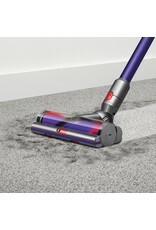 Equipped with a DC motor inside the brush bar, this cleaning head is more efficient, digging deeply into carpets to loosen and remove pet hair and fur, as well as dirt and debris. Along with this new motor, is the new in-line configuration. 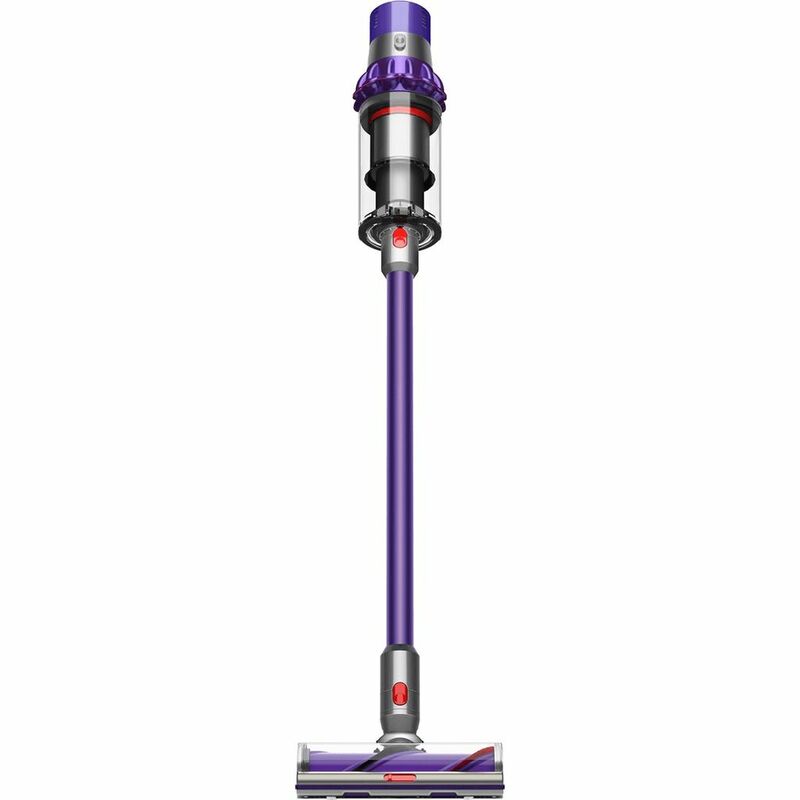 The motor, bin, and cyclones are all aligned so air is drawn directly from the cleaner head into the cyclones in a straight line, increasing suction to 20% more than the Dyson V8. 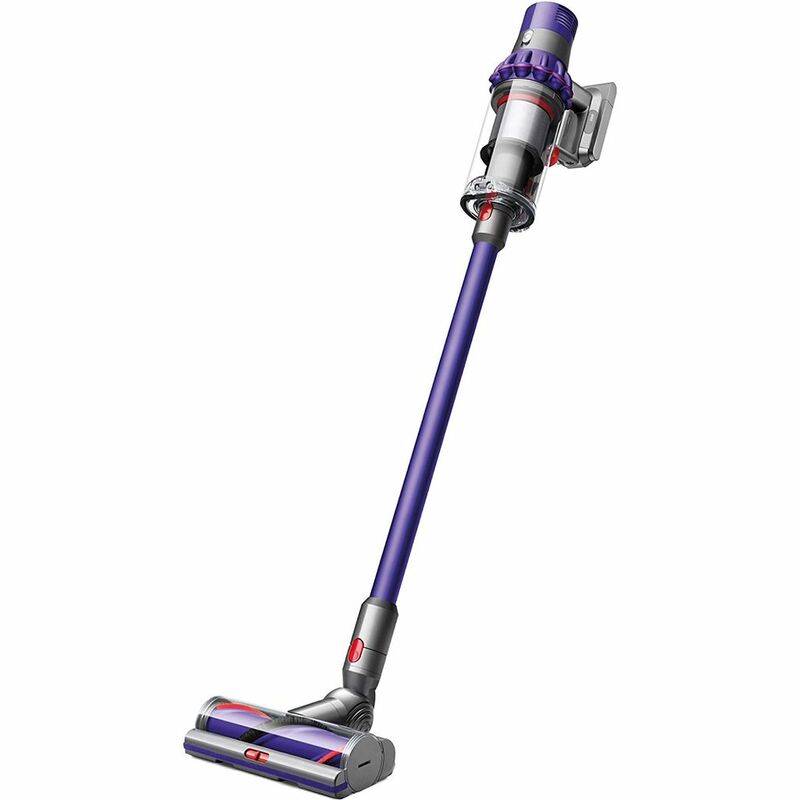 Dyson’s new digital motor is smaller, yet lighter and stronger than their V8 motor. Placing the impeller in the back of the motor, axial airflow draws in cooler air, reducing temperature and allowing the motor spin at up to 125,000rpm. 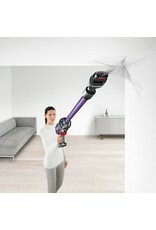 This generates the suction of a big vacuum, while giving you the convenience of a cordless stick vac. 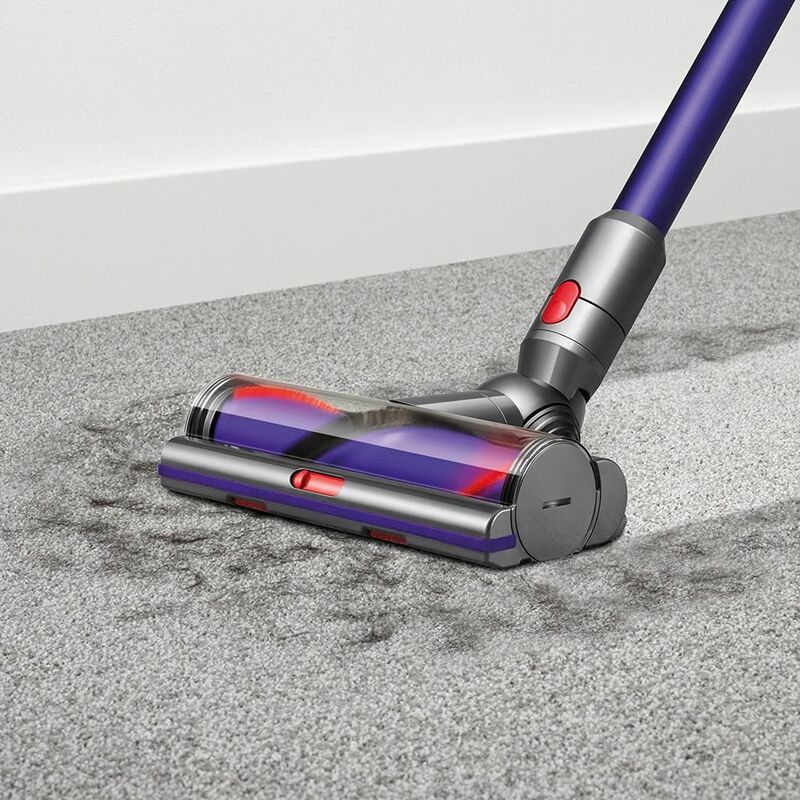 The 14 cyclones create 79,000g force that can throw dirt and debris into the dust bin, and because they are concentrically placed, airflow is more efficient. The cyclones narrow from top to bottom so as air flows through them it accelerates from 45 mph to 120 mph creating immense centrifugal force. 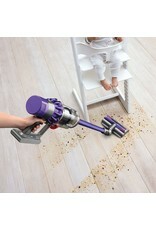 This enables the vacuum to capture even microscopic particles—not to mention pet fur and dander. 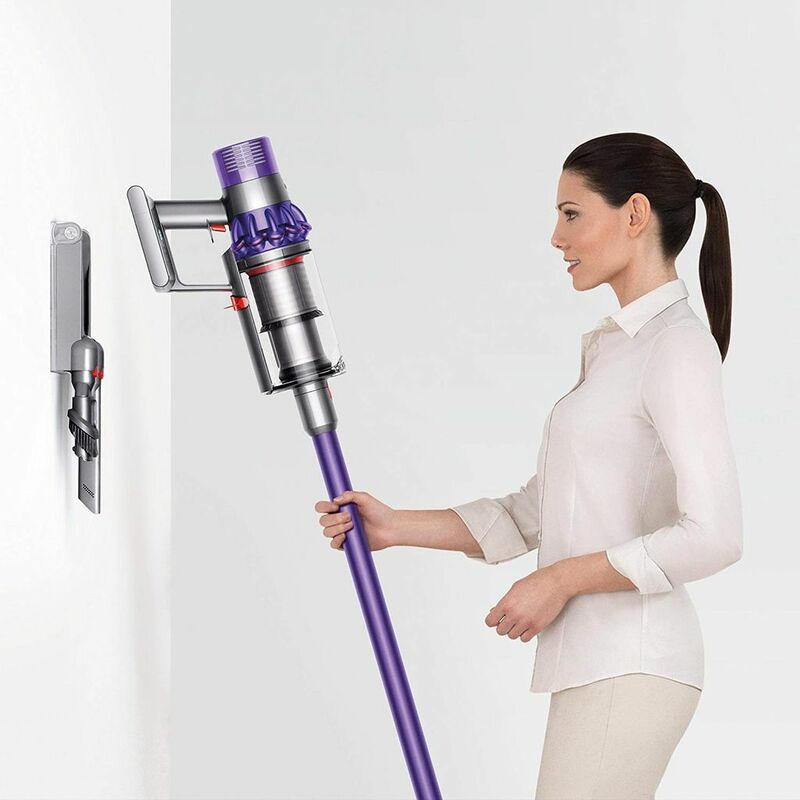 With the new in-line configuration, Dyson added new features to completely seal the whole machine so nothing escapes into your home air. Airtight Gasket: The entire cyclone assembly is surrounded by an airtight gasket so those microscopic particles can’t escape. Advanced Filter: Pre-motor and post-motor filters are combined into one unit so maintenance is much easier. Pressurized Rubber Seal: This new advanced filter is protected by a pressurized seal that keeps dirt, dust, and debris inside. 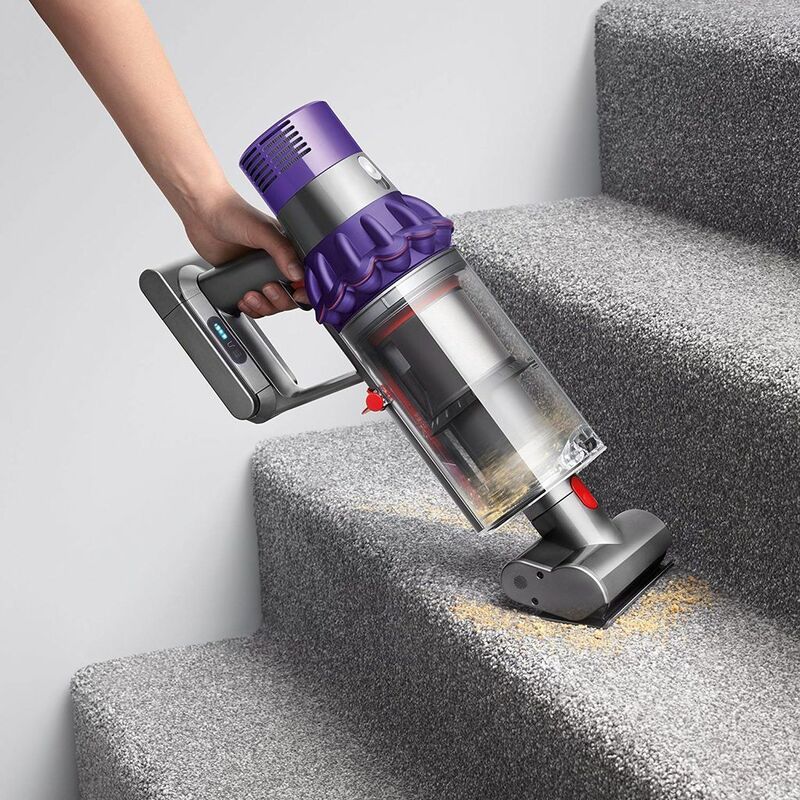 With whole-machine filtration, the V10 Animal retains 99.97% of particulates as small as 0.3 microns—HEPA Class filtration—and you get cleaner, fur-free air. 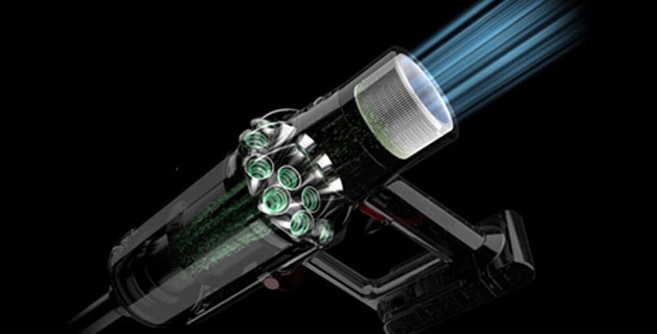 A lithium-ion battery with an additional 7th cell is more energy-dense without adding weight to the vacuum. With 7 cells, this battery runs at a higher voltage, creating more power than ever. Thanks to internal LED system diagnostics and altitude sensors, it automatically optimizes power to the cleaner head for fade-free power. Up to one whole hour of it! 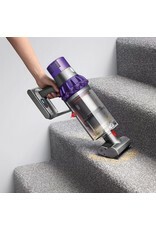 Mini Motorized Tool: This little handy-dandy tool has a motorized brush bar that takes on even long hair and ground-in dirt on upholstery, stairs, and other tight spaces. Soft Dusting Brush: Let’s face it, that soft beautiful fur flies around landing on surfaces like blinds, screens, tables and more. This soft dusting brush is large enough to cover a lot of surface area without scratching. 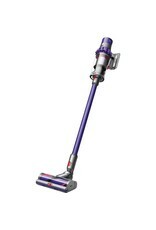 Dyson didn’t stop at a new motor, battery, and deep cleaner head. 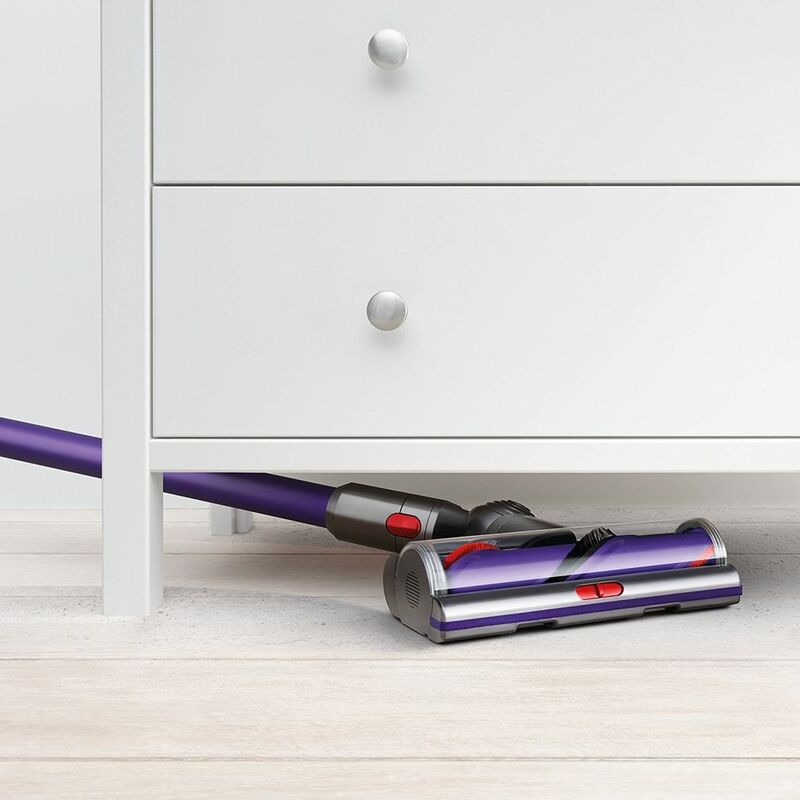 Take a look at these upgraded features that will make cleaning your entire home a breeze. 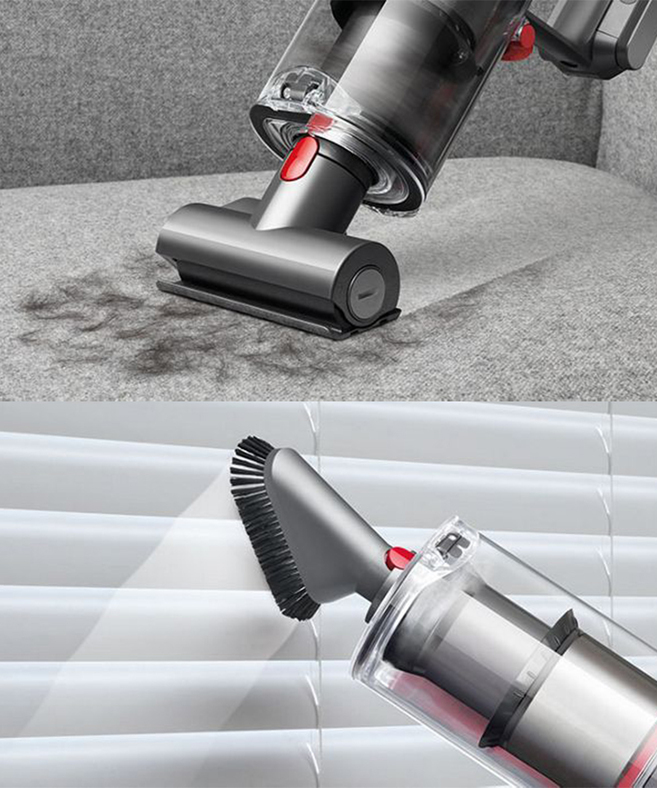 3 Cleaning Modes: Some cleaning jobs are tougher than others and require more suction so Dyson gives you 3 different cleaning modes on the V10 Animal. 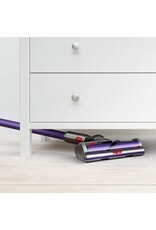 Soft-Touch Trigger: Maximizes cleaning time by only using the battery power when you need it. 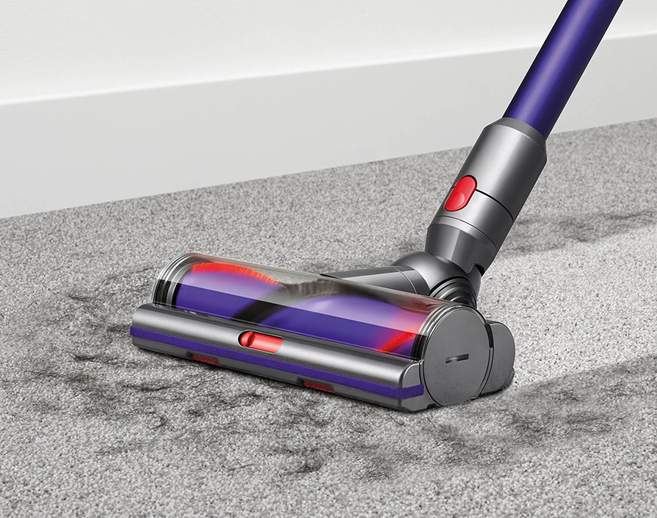 Acoustically Engineered for Quiet Operation: With new acoustic design features that absorb vibration and muffle sound, cleaning is a quieter process. 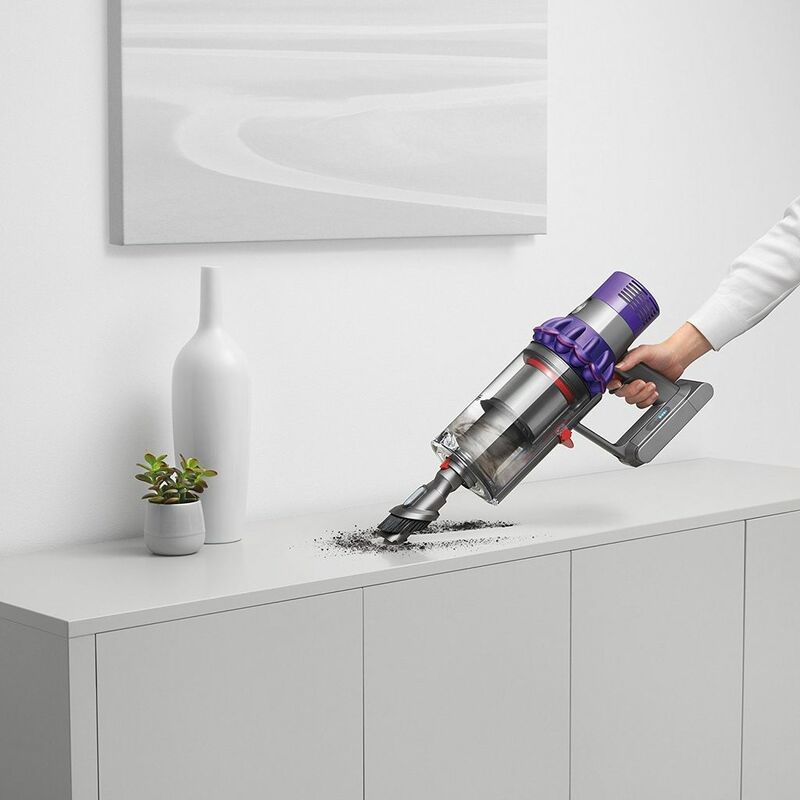 Dust Bin: The larger dust bin holds 40% more and features a ‘Point and Shoot’ emptying mechanism that is ultra-hygienic, literally ejecting debris deep into your waste bin in one simple action. Hand-held Transformation: The V10 Animal swiftly transforms into a handheld in one simple click, so you can easily reach any space where dirt and pet hair hide. 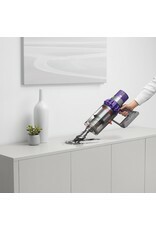 Drop-in Docking Station: When your cleaning is finished, drop the V10 into the wall-mounted dock for recharging. It also stores tools so you’re always ready to go. On-Board Indicator Lights: Not only can you see battery power levels, but machine blockage, filter cleaning required, and incorrectly fitted filter issues. 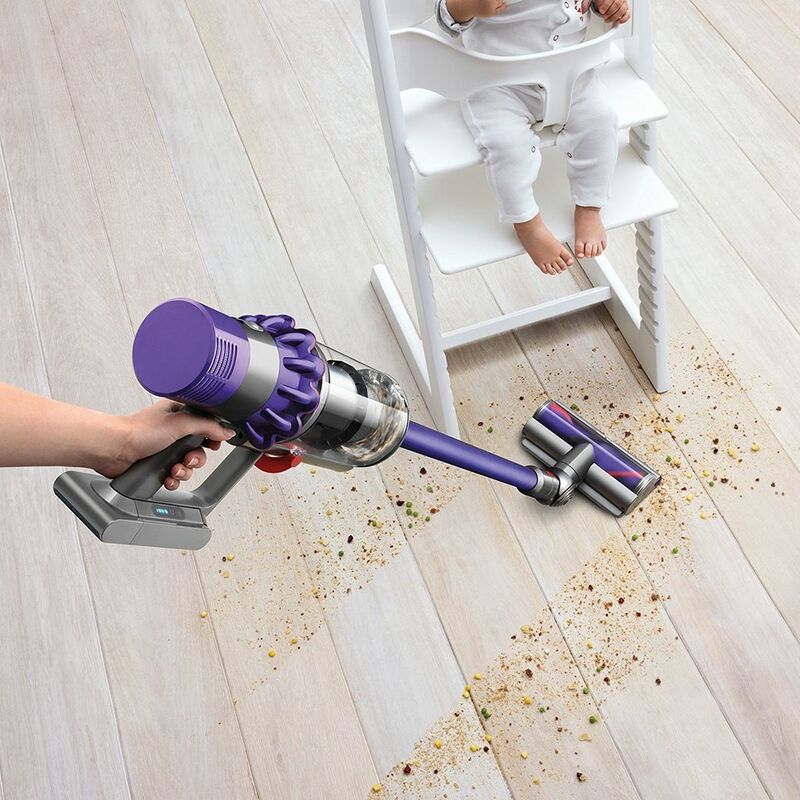 You’ll love cleaning up after your pets almost as much as you love them, with the Dyson V10 Animal Cordless Stick Vacuum. 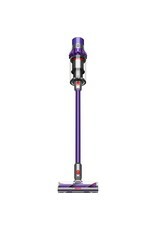 More suction, more power, more pet-friendly tools in a light-weight machine. What’s not to love?